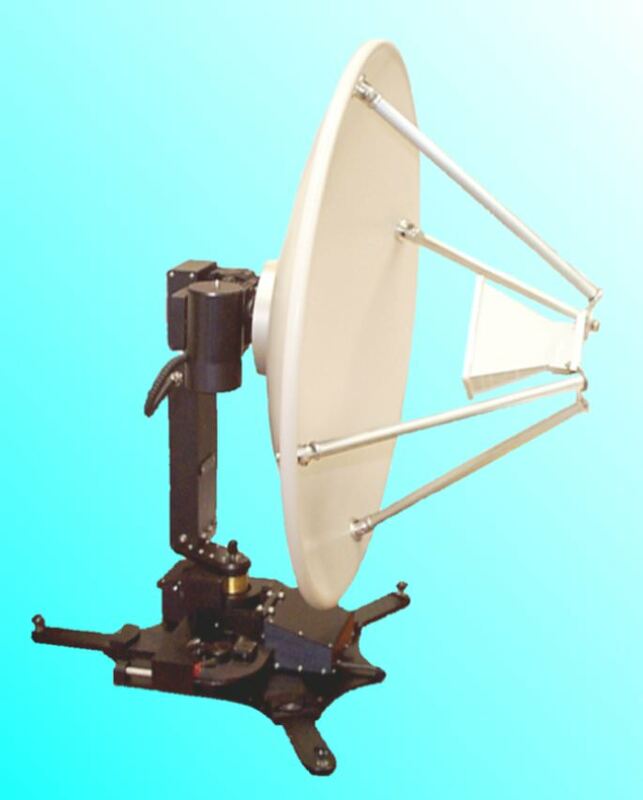 Light weight, 3-axis, easily transportable, rapid assembly antenna positioner. 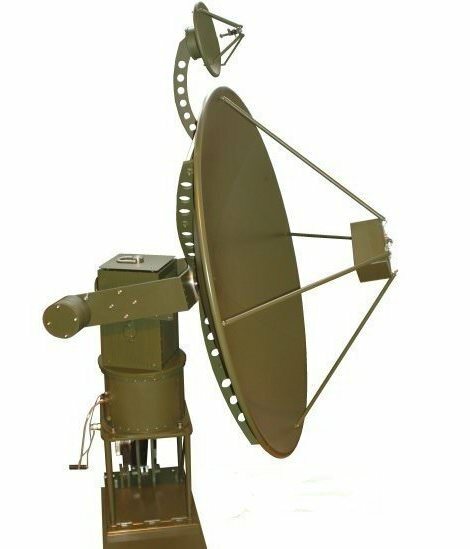 Our rugged computer controlled single axis system is ideal for ELINT broadband surveillance. The system is capable of complex scan control with rotation speeds of up to 200 rpm. 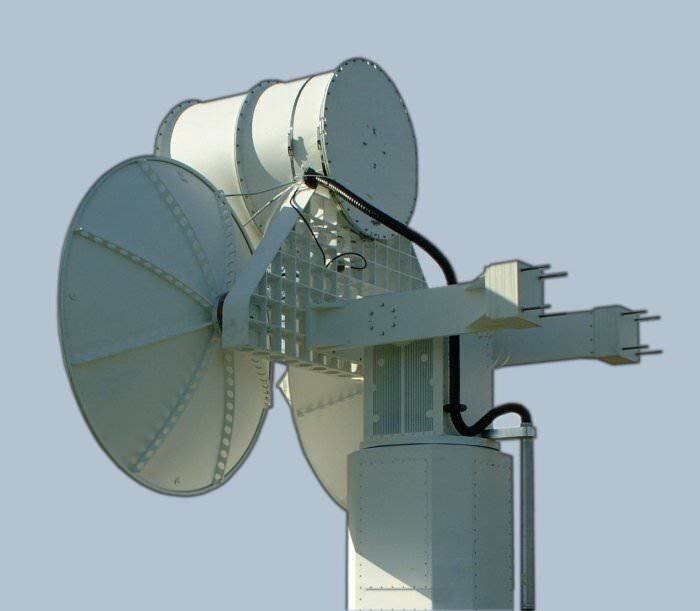 Many antenna / reflector - feed combinations are available to cover your frequency bands of interest with your gain / beamwidth requirements. 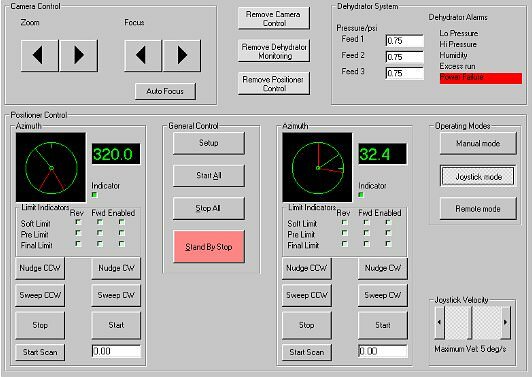 The control software allows different modes of operation, these include continuous rotation, sector scan, stare and nudge. The system is housed within an environmentally sealed radome for outdoor use. Rotational Velocity 200 rpm max. 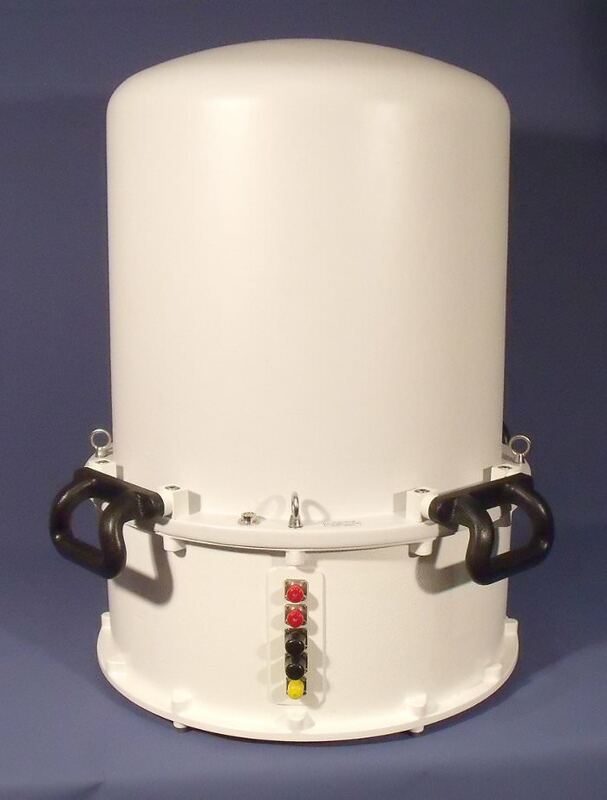 Built to the very highest standards, this was the standard version of the positioner from the All Weather Antenna Positioner family. 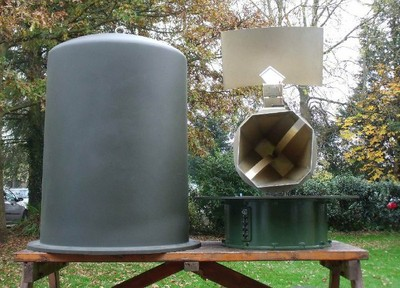 It was designed to operate with reflectors of up to 2m in diameter. 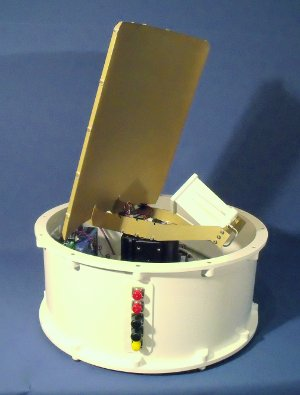 The positioner can cover 'whole sky' and can be used for surveillance, tracking and SIGINT as well as other signal/tracking purposes. 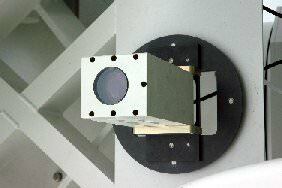 Can operate with reflectors of up to 2m in diameter. Other feeds, including RHCP & LHCP, and different reflector sizes can be supplied. Available with an extra locking button on the elevation, designed to lock the yoke vertically when using the positioner in high wind situations. Equipped with brakes on all axes in case of power failure. A Servo Controller Unit is used for each axis. The positioner is controlled via a single RS232 connection which is primarily designed to be controlled by our Graphic User Interface (GUI). Other interfaces such as USB, Network and Handheld controllers are available on request. Positioner can also be fitted with heaters, Peltier coolers and/or air dryer, if required for demanding weather conditions. This positioner design has all of the virtues of the all weather series, but with more than twice the torque. 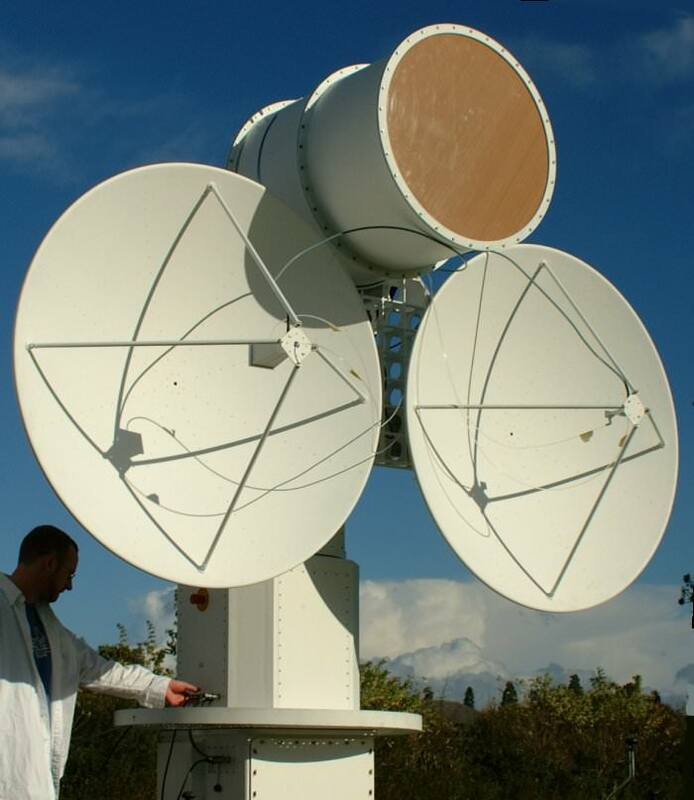 This enabled a greater variety of antenna solutions to be considered. This positioner was designed specifically to house an array of reflectors. 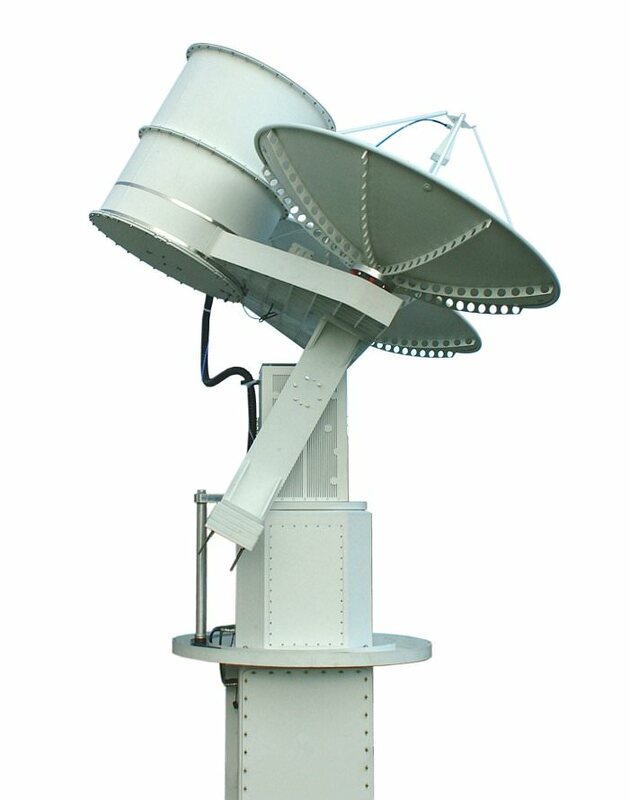 This is a heavy duty, fully environmentally hardened antenna positioning system. it was designed specifically for larger antenna arrays where positioning speed and precise angular accuracy are of the utmost importance. This positioner was designed to be operated in a wide range of environmental conditions. To achieve this performance exceptional care was taken in tailoring the design of this positioner to the particular requirements of its customer. The positioner body is designed for the minimum weight commensurate with the strength and ruggedness required for an all-weather unit. The main body of the positioner forms a sealed enclosure, with rotating weather seals for both the elevation and azimuth motions. The positioner can be fed with dry air, or supplied with passive dehumidification devices. A heat shield covers the top of the positioner, minimizing the heating effect of direct overheat solar radiation. 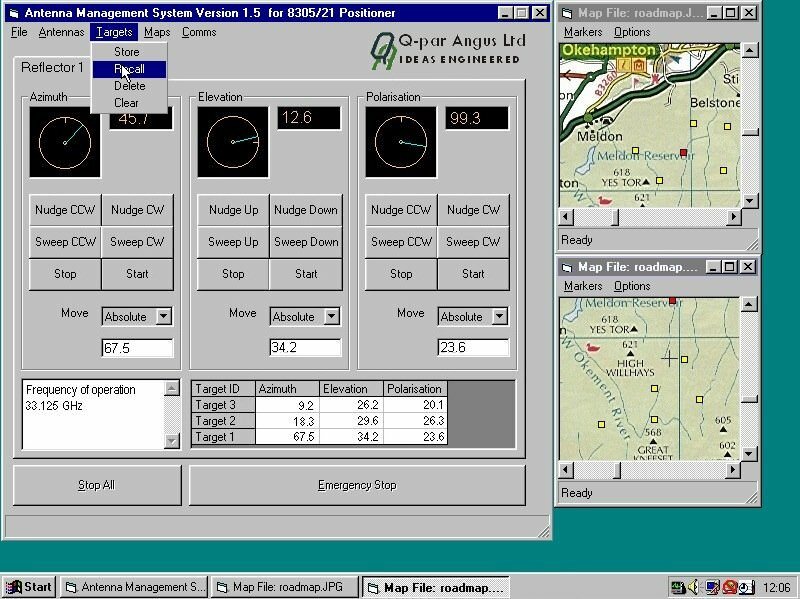 The azimuth and elevation drive speed was set according to the customer's demand. The system in the configuration shown, is capable of tracking, at a range of 1 nautical mile aircraft at speeds in excess of Mach 1.2. The positioner incorporates an automatic guidance facility that utilizes a high resolution, IR capable, camera to both locate and track targets. The internal design of the positioner is the result of many years of experience and development. High quality electrical servo motors drive through zero-backlash cycling-plate gearboxes and high quality final drive gears to give a accurate and controllable drive train in all axes. Drive motor torques and gear ratios are selected to achieve the slew rates and pointing accuracy required for each particular application. Axis position information is detected using high quality multi-bit digital encoders of appropriate accuracy. 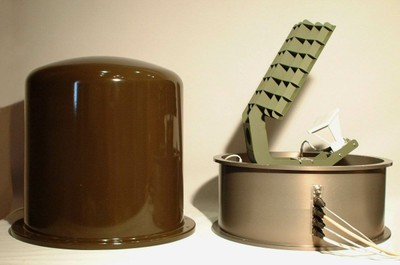 Factory set electro-mechanical stops are used to limit the positioner travel, for example, to prevent damage to an antenna dish. Electromagnetic brakes are incorporated to lock all axes in the event of power supply failure. Stowage pins are supplied to immobilise the positioner when not in use. 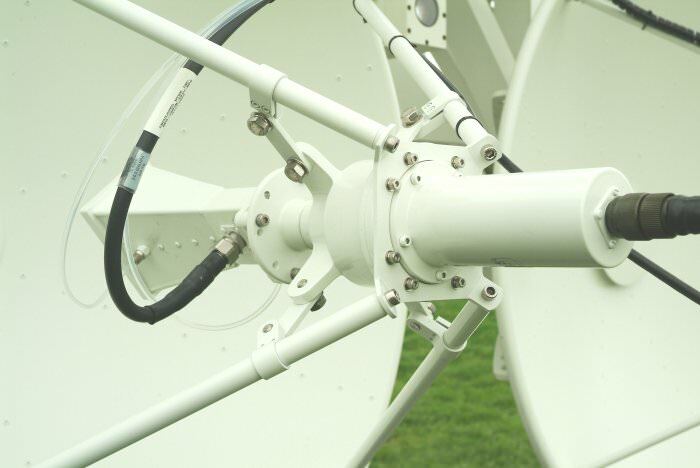 The antenna yoke is usually supplied with counterbalance masses to match the antenna to be used. A rigid plinth was supplied to raise the positioner to a height appropriate to the diameter of the dish being used. This is configured as a weather-proof enclosure to house the Air Drying Unit. All parts of the positioner and plinth are treated with protective finishes (anodizing, paint finishes as appropriate) to give corrosion resistance thus ensuring a long trouble-free service life. The positioner can be operated from a standard PC or laptop using our standard GUI Control; an handheld controller unit was also supplied to customer requirements. Both the GUI and the handheld controller can operate the positioner up to 1 km away. Q-par Angus designs and develops its Antenna Controller Units fully in house, offering a very high degree of flexibility to the customer in the control and indication options available. 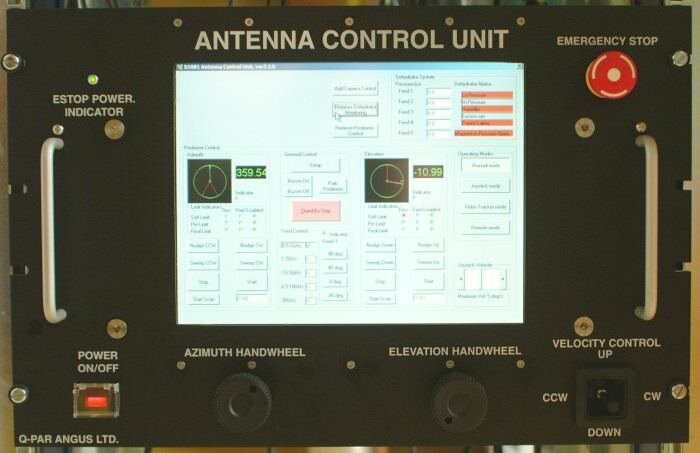 The antenna control unit is a 19” rack mount unit based around a Windows XP Professional operating system. Incorporating a 12” touch screen, the ACU provides control and monitoring of the whole antenna system. A Linux based system is also available. 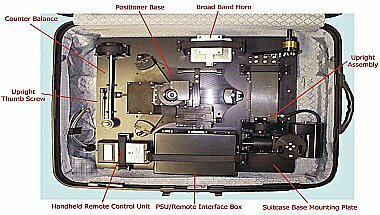 The unit shown includes Camera Control, Joystick Mode, Optical Tracking and Standard 2-Axis Positioner Control from a PC or handheld device. 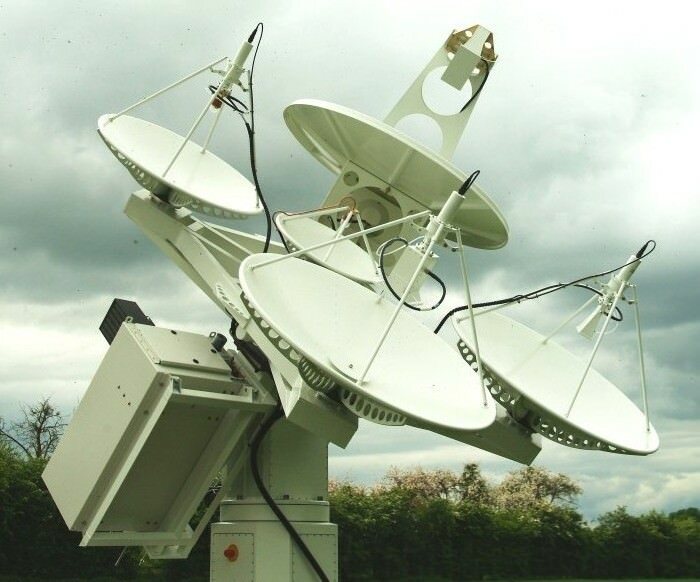 We are always happy to discuss specialist or bespoke requirements on our range of Antenna Positioners, Control Units & Software Interfaces.